and Forestry Research Institute of Great Xing’an Ridge, Jiagedaqi, China. Received August 6th, 2011; revised August 20th, 2011; accepted Septe mber 5 th, 2011. Zeuzera sp. and Faust Cockchaf er. 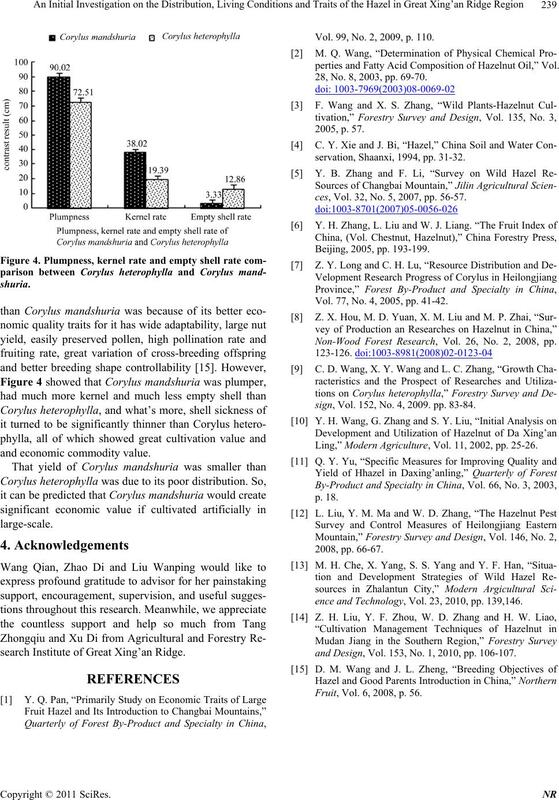 100-seed weight of C oryl us hete roph yl l a was more t ha n t w ice of Corylus ma nds h uri a.
great cultivation value and economic commodity value. due to its well-developed root system. onomy and there are about 20 species around the world. Cold Temperature Zone to Subtropical Climate Zone . 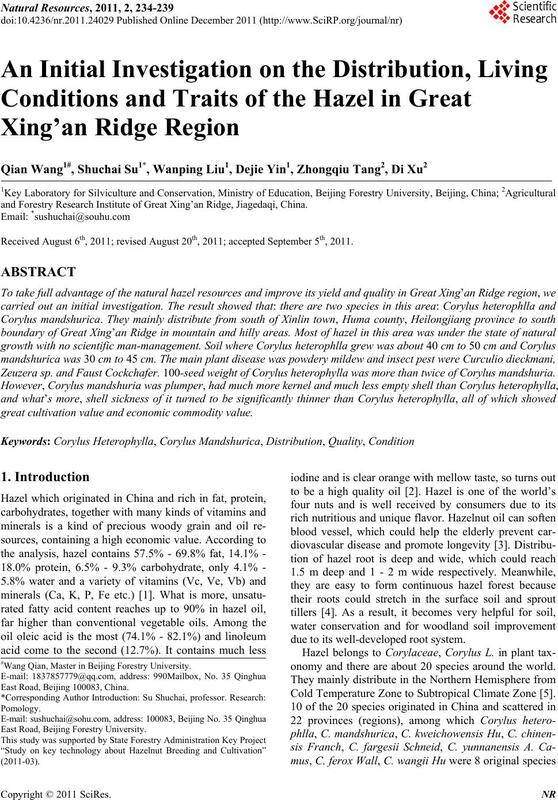 #Wang Qian, Master in Beijing Forestry University. East Road, Beijing 100083, China. East Road, Beijing Forestry University. lana L. are 2 cultivars . mountains or hilly regions at an altitude of 200 - 800 m.
hazelnut was finally included within cultivation fruit tree. 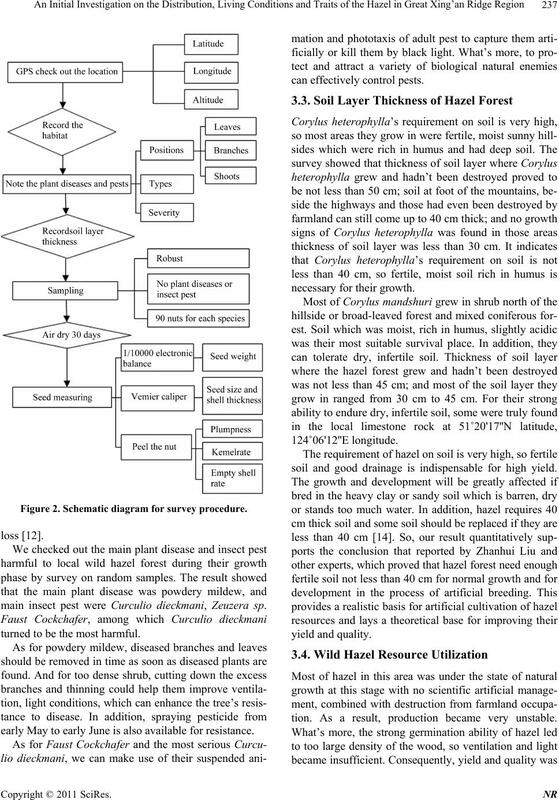 gram and development of economic forest industry . ment on wild hazel resource in China is imminent. retical basis for rational exploitation and utilization . is –52.3˚C. July average temperatures is 16˚C - 20˚C. average annual precipitation achieves 400 - 600 mm. and forest coverage rate reaches up to 75.16%. and had never really got exploration. empty seeds, shriveled kernels and serious insect nuts. 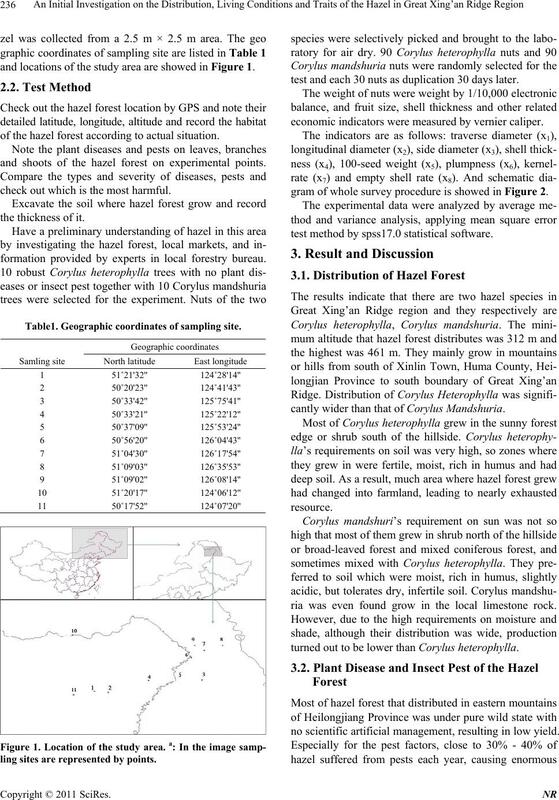 and locations of the study area are showed in Figure 1.
of the hazel forest according to actual situation. and shoots of the hazel forest on experimental points. check out which is the most harmful. formation provided by experts in local forestry bureau. Table1. Geographic coordinates of sampling site. ling sites are represented by points. test and each 30 nuts as duplication 30 days later. economic indicat ors we re measured by vernie r calipe r.
gram of whole survey procedure is showed in Figure 2.
test method by spss17.0 statistical softwa re. cantly wider than that of Corylus Mandshu ria. ria was even found grow in the local limestone rock. turned out to be lower than Corylus h eterophylla. no scientific artificial manag ement, resulting in low yield. Figure 2. Schematic diagram for survey procedure. main insect pest were Curculio dieckmani, Zeuzera sp. turned to be the most harmful. early May to early June is also available for resistance. soil and good drainage is indispensable for high yield. tion. As a result, production became very unstable. velopment needs of local area. by venier calipers and the result is as followed. search Institute of Great Xing’an Ridge. Vol. 99, No. 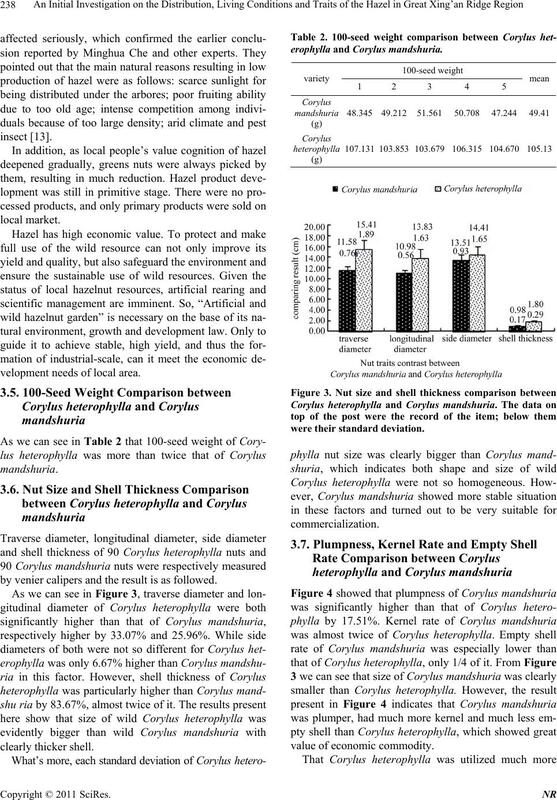 2, 2009, p. 110.
perties and Fatty Acid Composition of Hazelnut Oil,” Vol. 28, No. 8, 2003, pp. 69-70.
servation, Shaanxi, 1994, pp. 31-32.
ces, Vol. 32, No. 5, 2007, pp. 56-57. Vol. 77, No. 4, 2005, pp. 41-42. Non-Wood Forest Research, Vol. 26, No. 2, 2008, pp. sign, Vol. 152, No. 4, 2009. pp. 83-84. 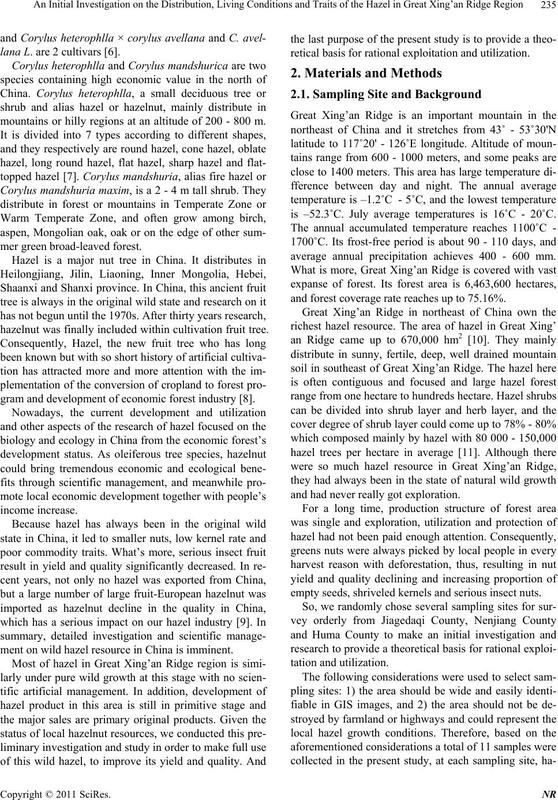 Ling,” Modern Agriculture, Vol. 11, 2002, pp. 25-26.
ence and Technology, Vol. 23, 2010, pp. 139,146.
and Design, Vol. 153, No. 1, 2010, pp. 106-107. Fruit, Vol. 6, 2008, p. 56.